My first adventure! 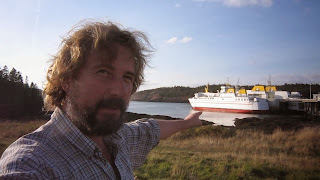 My good friend and Oceanographic scientist, Dr. Neil Fisher needs help with a field maintenance tour of the Bay of Fundy! 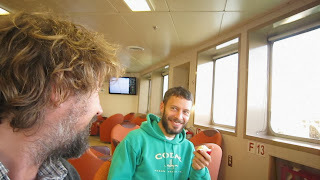 With the truck on hold while we wait for parts, Neil picks me up on his way to Gran Manan for our first stop. Having never been to Gran Manan I was really looking forward to the trip until Neil pointed out that there isn't a single pub on the island. Oh well I always enjoy a ferry ride. too and has been a good friend for many years. Everyone should know at least one scientist. Arriving too late in the day to do any meaningful science we found the sole open restaurant and had a lovely deep fried bonanza. Back at the motel a trunk full of beer made up for the lack of a pub. We didn't quite see the dawn that night but made a good effort.